Click download, then save and open button, tell me what it does. Thanks for everyone's help in trying to figure this out. When I click download it says "adobe reader could not open because it is either not supported file type or because file has been damaged." 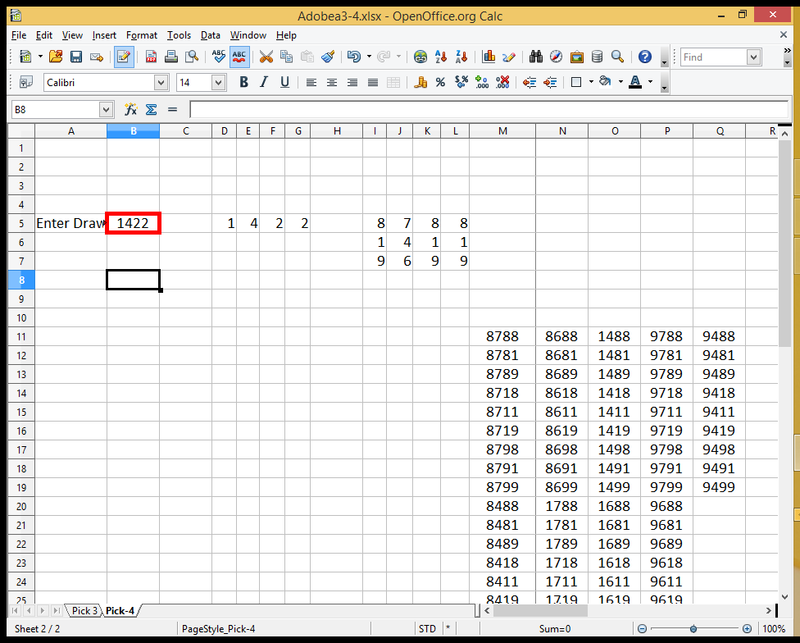 it is defaulting to that I guess instead of excel for some reason. You can't use "Adobe Reader"????? Open Office users. Open spreadsheet, the open Carligs' spreadsheet. Please give a new list for NC. Use the link just posted for picks or workouts, Posting predictions ends with the link, good luck to all. Thank you everyone for your help today. Able to open but not save, able to work some numbers. Try doing a "Save As" instead of a straight save..
adobea thanks for sharing! your knowledge and work is incredible! Convert this 4*4*4 matrix into positional picks, that should be wagered for 20 combined draws , all str88 bets. A> your wheel could be less than 256 picks dued to repeated digits in matrix ,B>25cents for str bet online cost $896 for profit of 2225-890>$1354 ,C> playing one draw type D or E reduces cost, current cost for one type> 256 x 10 days>2560 for profit of >5000-2560(2440) or 9000-2560 (6440 online). D> You can reduce the matrix by using SEQUENCE and DRIVE digits factors to just 16 picks, but your time frame needs to be extend why you adjust your cost. NB> This cost analysis is critical and can be further reduced, if you follow the strategy, if you can't wage online for personal or whatever reason, then reduce the picks to just 16,48 or 64 picks by the filter factor ' SEQUENCE and DRIVE DIGITS discussed and commented on numerous times on this and other thread, the filter factor is a PRIORITY tool when you want to reduce the matrix, am not going rehash, read the post. NB> reduced matrix means Extended Time frame. NB> since the digits of matrix is generated in order priority (sequence), rows 1 and 2 which contains the drive digits(a,b,e,f) of columns 1 and 2 should be fixed(looking for str bet), this simple tool filters the matrix but maintains predictions points for positions 1 and 2. This page was generated in 0.0645 seconds.